FC Barcelona produced an absolutely staggering display to beat Celta 5-0, a win that not only means they stay top of LaLiga but that also served as the perfect dress rehearsal for ‘operation comeback’ on Wednesday. 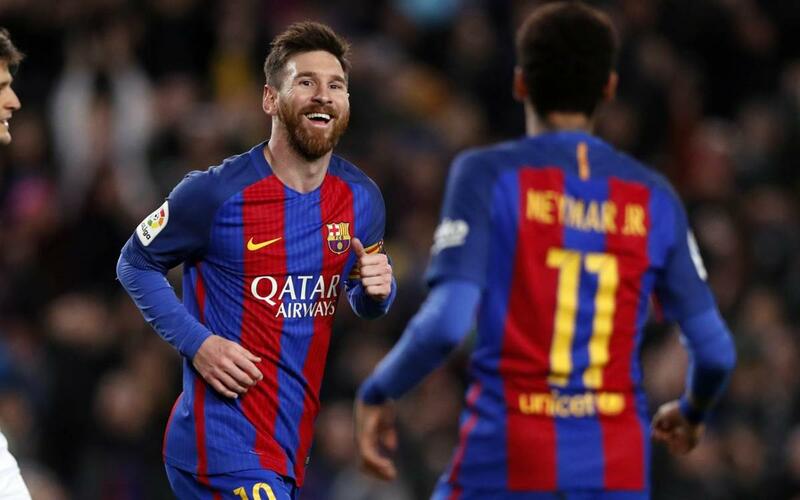 The performance that the Camp Nou was treated to on Saturday night was enough to get even the strongest sceptics reassessing their predictions. Turn around a 4-0 deficit against PSG? With football like we saw tonight, absolutely anything is possible! Barça were bossing Celta so convincingly with their quick one-touch passes that it was hard to believe that it took 13 minutes to get visiting keeper Sergio Álvarez’s gloves warmed for the first time with a low drive from Leo Messi. There was one scare when Facundo Roncaglia really should have done better after intercepting Samuel Umtiti’s clearance, but otherwise it was Barça all the way for the first 45 minutes. Neymar Jr narrowly failed to chip Álvarez, we had an extraordinary moment when both Luis Suárez and Messi hit the post in rapid succession, and there were calls all around the Camp Nou for a penalty when Hugo Mallo appeared to hack down Neymar in the area. It was vintage Barça, and when the goal finally came, it was vintage Messi. The Argentinian collected the ball in the centre circle and went on to casually skip his way through the sky-blue shirts before swinging the ball home from the edge of the area. And as he has already done so many times, the European Golden Shoe leader did it all with such casual confidence that the impossible was made to look simple. It was showtime at Camp Nou, and Celta were much very playing the supporting role to the lead actors. The inevitable second goal came after 40 minutes and it was every bit as much fun as the first. This time Messi was the provider, with a pinpoint through ball to Neymar, followed by a spot of Brazilian magic to cheekily dink the ball into the net. We were being treated to some of the best minutes of football at the Camp Nou this season, and the great news at half-time was that there were still another 45 of those to come. They didn’t disappoint. Following another twelve minutes of dazzling dominance, Ivan Rakitic was pouncing on a Rafinha assist to make it three. Four minutes later, Messi’s killer pass ended up at the feet on none other than Umtiti to tap in his first ever goal in a Barcelona shirt. And just three minutes after that, Messi went on a shimmying run in from the right before tucking away number five. The showboating could have continued, but by this point Luis Enrique had clearly seen enough. Sergi Busquets, Sergo Roberto and Neymar were brought back into dock with Wednesday’s Champions League fixture in mind and the Catalans took their feet off the accelerator for the final twenty minutes or so. This game was already over. Wednesday brings a whole new challenge, but following all the gloom after the defeat in Paris, there is a whole new vibe at the Camp Nou now. As several banners around the stadium proclaimed at the end of the match – there is a very real belief among the fans that something very special might be about to happen on Wednesday night. And with football like we saw tonight - who doesn't dare to dream? Get your tickets now!